How Should I Use Topical Mydriatic and Cycloplegic Agents? Topical mydriatic and cycloplegic agents are an integral part of the daily routine of eye care specialists, often used for both diagnostic and therapeutic purposes. Mydriasis is dilation of the pupil by means of dilator contraction by adrenergic agonists or sphincter relaxation by muscarinic antagonists. Cycloplegia is the paralysis of the ciliary muscle by antimuscarinics, inhibiting accommodation and decreasing tension on the scleral spur. The efficacy and length of effect produced depends on each agent, as stronger agents tend to be longer acting. Indications for use include cycloplegic refraction, dilation for ophthalmoscopy and testing, surgery, suppression during amblyopic therapy, palliative care for phthisis, and uveitis. Several examples of these medications (eg, atropine, homatropine, and cyclopentolate) actually possess both characteristics and prove to be the most relied upon agents in the treatment of uveitis. This dual action is useful in uveitis therapy for several reasons. Ocular pain and photophobia induced by ciliary spasm can potentially be reduced. There is thought that decreased vascular permeability may lead to lower amounts of inflammatory cells and protein in the anterior chamber (flare). Most importantly, avoidance of the formation of new and severing of previously formed posterior synechiae, which can severely limit both visual acuity as well as diagnostic capabilities, is achieved during dilation by virtue of decreased contact of the posterior iris with the anterior lens capsule as well as the cycloplegic decrease in lens thickness and convexity.1 Dark-pigmented irides are notoriously less responsive to these agents and may require increased dosing or a stronger agent. Opinions vary widely on which agents to use and when to use them. Table 19-1 shows one such example of an algorithm for using mydriatic and cycloplegic therapy. Some treat with any evidence of anterior chamber inflammation. For mild to moderate iritis, I generally observe without use of these agents while treating the inflammation as necessary. Extreme symptoms of photophobia or more severe or stubborn inflammation may eventually prompt the temporary addition of a cycloplegic, especially with signs of impending synechiae. The most popular treatment options include cyclopentolate 1% and ­homatropine 2%. Each has sufficient cycloplegic efficacy along with an intermediate length of action (24 hours or more) and can be dosed 2 to 4 times daily until the inflammation recedes. Cyclopentolate may have a disadvantage as it has been shown to be a ­chemoattractant to inflammatory cells in vitro.2 A short-acting agent such as tropicamide 1% is useful for diagnostic purposes, and it is arguable that a 4-times-daily dosing schedule may allow sufficient mobility of the iris to prevent synechiae, but this would likely be at the expense of poorly reducing symptoms as it is only weakly ­cycloplegic. The reverse argument can be made for atropine 1%, a more powerful and longer-acting cycloplegic, which may allow for greater control of ciliary spasm and prevention of central synechiae. Its potency, however, effectively immobilizes the iris for days at a time and, while not allowing mobility, could conceivably contribute to synechiae in the dilated state. Additionally, atropine has a lasting effect on visual acuity, and potential systemic side effects are problematic. Scopolamine 0.25% may have a cycloplegic efficacy similar to atropine and a shorter duration of effect, but it unfortunately has a greater ability to cross the blood-brain barrier and affect central nervous system receptors. A so-called “dynamite cocktail” of potent agents (ie, atropine 1%, epinephrine 1:1000, and cocaine 4%) in concert with a cotton pledget may be employed when synechiolysis is particularly difficult.3 Subconjunctival injection of a combination of atropine, procaine, and adrenaline has also been used, but with serious potential systemic effects.4 Sympathetic agonists such as phenylephrine 10%, while not helpful with cycloplegia, are effective mydriatics and can be used to aid synechiolysis. Phenylephrine 10% has been shown to induce the release of pigment granules into the anterior chamber, possibly through pigment epithelial degeneration during iris contraction, which, though microscopically distinct, can easily be misinterpreted as inflammation or microhyphema in the appropriate setting. Proper evaluation of the anterior chamber should always be performed prior to application of any mydriatic when looking for cell and flare. Disadvantages of these agents include the severe stinging many patients experience upon application that can sometimes be more bothersome than the ciliary spasm it was intended to treat. 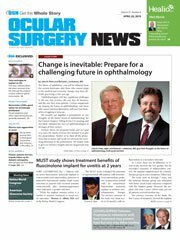 Patients are relieved upon discontinuation not only for this reason, but because of the significant blurring created by cycloplegia. An endpoint in cycloplegic treatment must be considered in every case. There should almost never be a reason to submit to standing doses of these cycloplegic agents. Still, significant active uveitis must always be addressed with aggressive treatment until it is quiet, and it may be reasonable to use these agents for long periods when all efforts to squelch the fire are being thwarted. Along with blurring and the general discomfort produced, ocular side effects include atopic response to the medication or vehicle, which may affect the lids or the ocular surface. Multiple medications and confusion in dosage may increase risk of noncompliance with other more vital therapy. There is also the known danger of mydriatic induction of acute closed-angle glaucoma. Interestingly, intraocular pressure in open-angle glaucoma has also been shown to increase with these drops by a mechanism that is not completely understood. It is thought this may relate to trabecular outflow and the effect of changing tension on the scleral spur. One must be mindful of glaucomatocyclitic crisis, an inflammatory condition where high pressures may possibly be exacerbated by use of these agents. Systemic side effects have also been well documented. Phenylephrine 10% may greatly increase blood pressure in infants, diabetics, and the elderly and, therefore, is usually avoided in these patients. 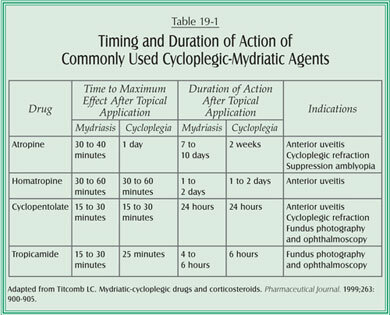 Circulating levels of cycloplegics may exert an effect on muscarinic receptors throughout the body, initially causing dry mouth and flushing. Other more serious documented effects include urinary retention, tachycardia, somnolence, ataxia, hallucinations, and seizures. There have even been reports of abuse of and dependence on cyclopentolate.5 These are rare and generally stem from overuse of the stronger drops like atropine; however, some severe effects have also been seen with therapeutic levels of even weak cycloplegics. Again, infants and the elderly seem especially prone to this, as well as White males with Down syndrome, and care of these patients should reflect this. Mydriatic-cycloplegic agents have their place in the treatment of uveitis. Whether they should be used and in what circumstances are up for debate. I suggest they be treated similar to topical steroids in that they may occasionally be used for acute symptoms and rescue (from synechiae), but that they should be discontinued whenever possible. 1. Bartlett JD, Jaanus SD, eds. Clinical Ocular Pharmacology. 3rd ed. Boston, MA: Butterworth-Heinemann; 1995. 2. Tsai E, Till GO, Marak GE Jr. Effects of mydriatic agents on neutrophil migration. Ophthalmic Research. 1988;20:14-19. 3. Foster CS, Vitale AT. Diagnosis and Treatment of Uveitis. Philadelphia, PA: WB Saunders Co; 2002:159-165. 4. Jayamanne DGR, Fitt AWD, Wariyer R, Cottrell DG. Persistent tachycardia following subconjunctival injections of mydriatic agents (Mydricaine) used for maintenance of perioperative mydriasis in vitreoretinal surgery. Eye. 1995;9:530-531. 5. Sato EH, De Frietas D, Foster CS. Abuse of cyclopentolate hydrochloride (Cyclogyl) drops. N Engl J Med. 1992;326:1363-1364.